This itinerary is perfect for those fascinated by Sicily’s historic wonders and classic Italian beauty. See baroque churches, seaside towns, and ancient temples from Syracuse to Taormina, guided by savvy local experts. 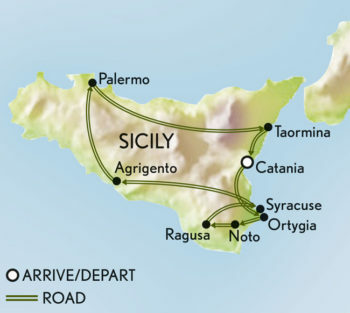 Arrive at Catania’s airport and you will be transfered to your hotel in sun-drenched Syracuse. Nearly 3,000 years old, the city played its part as a powerful stronghold in the Mediterranean during ancient times. It was the birthplace of Archimedes and frequented by Plato. Cicero called it “the greatest Greek city and the most beautiful of all”. Spend the rest of the afternoon strolling around its golden piazzas and baroque buildings. Then head for dinner at a local restaurant for your first taste of no-nonsense Sicilian cooking. The white island of Ortygia is Syracuse’s historical centre, lapped by the sparkling Ionian Sea. Images of ancient Greece and its deities (Artemis was supposedly born here) are conjured as you navigate medieval lanes, temples, and striking duomos. Stop at Chiesa di Santa Lucia alla Badia to see Sicily’s famed Caravaggio masterpiece, The Burial of Saint Lucy. Then visit a Greek theatre and an impressive Roman amphitheatre. If you wish, there is also time to enjoy the Paolo Orsi Archaeological Museum with its displays of Neolithic pottery and Greek statues. Surviving an earthquake in the last gasp of the 17th century, the historic towns of Sicily’s south-eastern corner made a glorious recovery. Take the day to explore honey coloured buildings and graceful churches flanked by picture-perfect Italian seaside. Noto’s Baroque cathedral is especially splendid, while Ragusa’s treasures are to be found on a rocky hilltop. The views you get from its tangled alleyways are worth the steep climb. The region is known for great food: homemade gnocchi; fresh swordfish from Michelin-starred restaurants; and family-run trattorias. The area is also celebrated for artisanal chocolate. Set off to Agrigento to explore the Valley of the Temples, built by ancient Greeks and now Sicily’s most prized archaeological site. Wander around Doric temples dating back to the 5th century and dedicated to deities including Hercules and Juno. You’ll meander among 1,000-year-old olive trees and ponder Greek kingdoms before heading to your hotel, a stone’s throw from the park. Head to seaside city Palermo, a couple of hours’ drive away. Stop en route at Monreale Cathedral, a place of intoxicating beauty. It’s a stupendous example of Norman architecture where you can investigate 12th-century gold leaf mosaics, palm dotted grounds, and colonnaded cloisters. Continue to your hotel in Palermo and check-in. Feeling peckish? Grab some arancini at the food market and settle down to enjoy it in one of Palermo’s beautiful squares. Take the morning to enjoy a sweep of the city’s finest churches. As captivating as it is romantic, much of Palermo’s history can be seen on foot. First stop the cathedral, to admire its white marble shell and panoramic rooftop views. Walk to old Palermo’s Quattro Canti where you can visit the pared-back church of San Cataldo with its three red domes. Then pop into the Palatine Chapel, small but dazzling – yet another Norman triumph. You can sooth any aching muscles with a massage back at your hotel. Option 1: A day at the opera Step inside Palermo’s romantic Teatro Massimo, the largest opera house in Italy. It featured in the film The Godfather III, a testament to its dramatic appearance. Option 2: Sample some street eats. Hit the food market to try local delicacies such as panelle (chickpea fritters) and gelato con brioche, the ultimate sweet treat. Those feeling adventurous should nibble on pani ca meusa (spleen sandwiches). It’s an early start to get to Taormina. Along the way, you’ll stop at the rural town of Piazza Armerina to take a look at Villa Romana del Casale, once a luxurious Roman abode. Observe its exquisite mosaics depicting mythological scenes before continuing to the hilltop town of Taormina. Arrive at your final hotel and drink in the sea views. Soak up la dolce vita at this outpost at the foot of Mount Etna. Over the years, Taormina has hosted famous faces from DH Lawrence, who lived here in the 1920s, to various rock stars. Who would blame them? It’s achingly beautiful with narrow streets, uninterrupted sea views, and an inspiring Greek theatre. Spend the day exploring at your own pace before a farewell dinner at a local restaurant. Today your driver will take you to the airport for your departure from Sicily.